MBA I Year II Semester students get production process experience by visiting Industrial Visit to Vijaya Dairy Milk Tarnaka on 28.01.2019. "Two day seminar on Research scholors summit"organized by Department of ECE in association with Directorate of R&D JNTUH, Hyderabad @ Dec 3-4,2018. MBA II and IV Semester class work will be commencing from 07.01.2019. "Seminar on Blockchain Technology and DevOps" organized by Department of Information Technology @30 th Nov - 1st Dec. I B.Tech I Semester(R18) Examination Notification Nov/Dec 2018. B.Tech(R15&R17) I,II,III & IV year I Sem and II Sem Regular & Supplementary Examinations Notification Nov-Dec 2018. I B.Tech II. SEM. Advanced supplementary RC/RV Notification October 2018. MBA-I semester(R17/R15/R13)(JNTUH) Regular/Supplementary Examinations - December-2018. I B.tech II Semester(R17) Advanced Supplementary Examinations October 2018 Notification. MBA, M.Tech RC/RV Notification September-2018. "Innovation and Incubation - Opportunities and Challenges" Expert talk on 1st September, 2018. 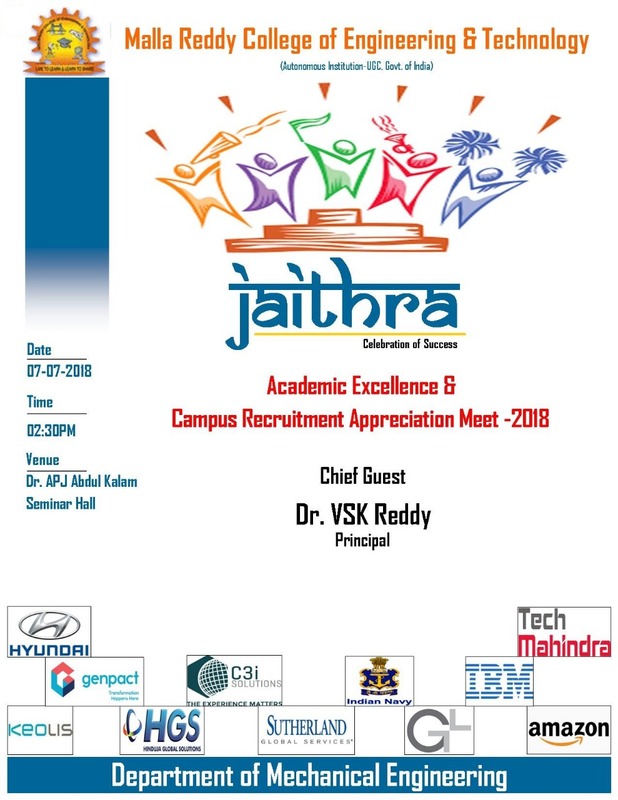 Invitation - Orientation MRCET 2018 - M.Tech. Extension of the period of Accreditation Status granted to MBA program. Invitation - ORIENTATION PROGRAMME for B.Tech 1st Year Students & Parents On Monday, July 16, 2018 at 10.00 A.M .
Five Day CRT for II Year Mechanical Engineering Students during 25-29 June, 2018. Three day CRT program scheduled for II year ECE students from 26/06/2018 to 28/06/2018. M.TECH - I SEMESTER– R17 SUPPLE EXTERNAL EXAMINATIONS, JULY-2018. 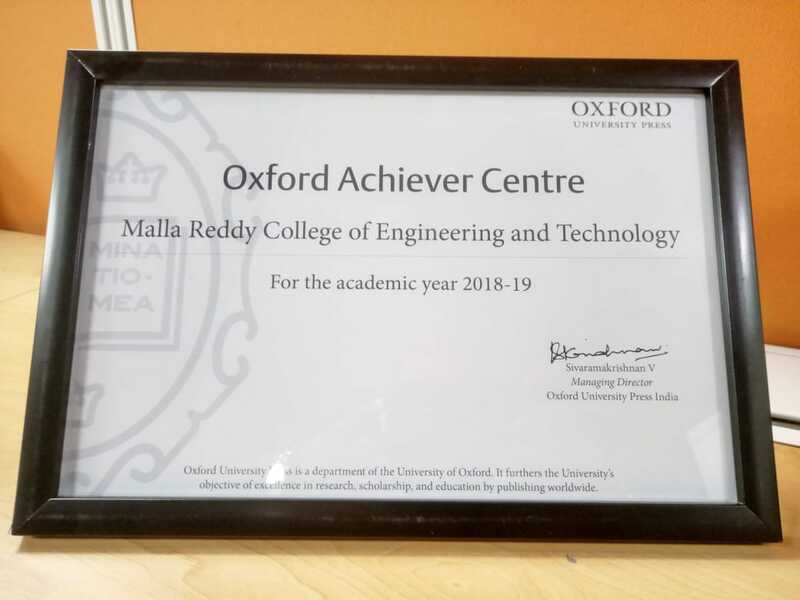 MRCET recognised as official centre by Oxford University to offer certificate training programmes for students and faculty. 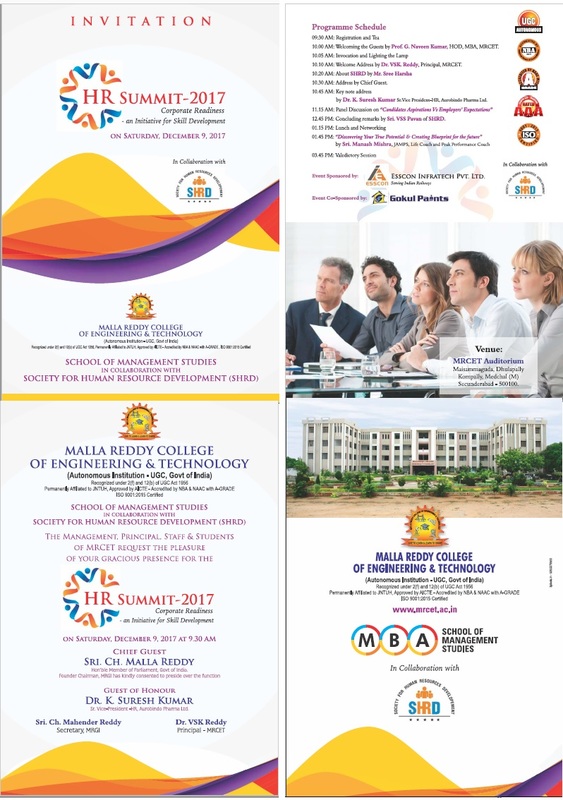 MRCET is the only college recognised as official centre in the entire states of AP& Telangana. M.TECH - II SEMESTER– R17 REGULAR EXTERNAL EXAMINATIONS, JULY-2018. M.B.A - II SEMESTER– R17 REGULAR EXTERNAL EXAMINATIONS, JULY-2018. ALL THE STUDENTS OF II & III YEAR B.TECH I SEMESTER ARE HEREBY INTIMATED THAT THE COLLEGE REOPENING DATE ON 25TH JUNE 2018 AND IV YEAR B.TECH I SEMESTER ON 18TH JUNE 2018. 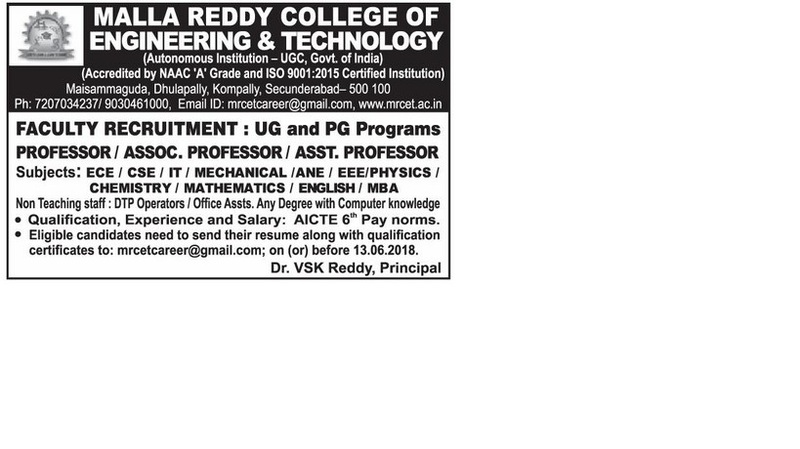 Faculty Recruitment : UG and PG Programs Professor / Assoc. Professor / Asst. Professor. RC/RV III B.TECH - I & II Sem (R-15) Reg/Supply Apr/May-2018. 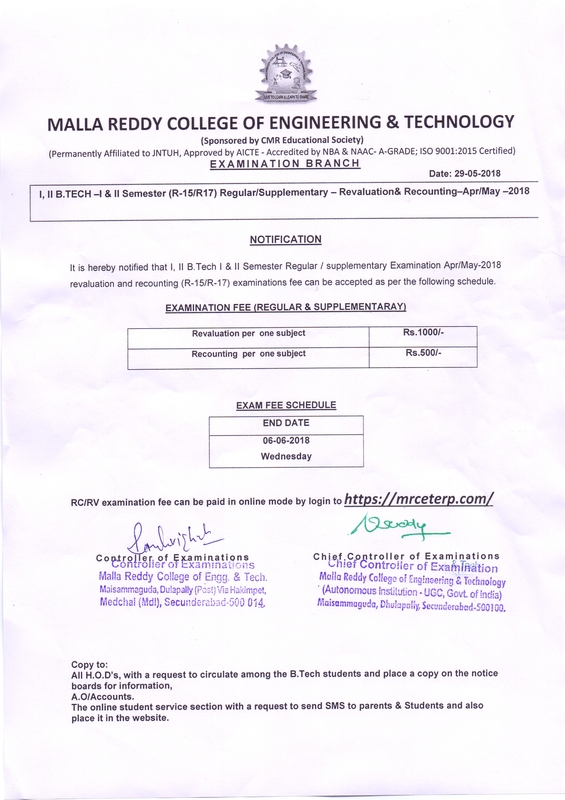 B.Tech RC/RV Reg Supp Notification Apr/May - 2018. GRADUATION DAY CELEBRATION-2018 is scheduled on 9-6-18(Saturday) at 9.30am.Venue: Main Auditorium. MBA & M.Tech Notification July 2018. All the 2015-2016 admitted M. Tech and MBA students who had completed their degrees can apply for JNTUH original degree at JNTUH University.